Dragon Lady Lo-Mein, aka the ultimate party noodles: double (or triple) the recipe, make ahead, then cover with aluminum foil and re-heat in the oven at 325 degrees for 15-20 minutes. Also very buffet-friendly because it also tastes great at room temperature. Offer plenty of hot sauce on the side! Trim off excess fat from chicken thighs, and cut meat into 1/2” pieces. Place in a shallow bowl. Sprinkle corn starch on chicken and turn to coat. 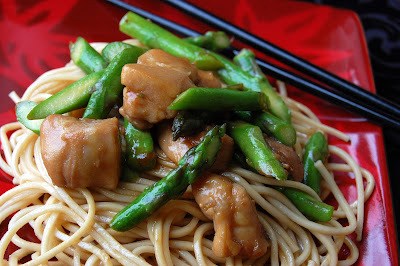 In a small bowl, whisk together 3 tablespoons soy sauce and 2 tablespoons oyster sauce. Pour over chicken and turn to coat. Set aside. In a large stock pot, bring 5 quarts of water to boil. Add noodles and cook until done (about 5 minutes). Drain noodles in a colander, and rinse with cold water. Shake out excess water completely. Transfer noodles to a 9x13 Pyrex dish (or large platter). In a small bowl, whisk together the remaining 2 tablespoons soy sauce, remaining 4 tablespoons oyster sauce and sesame oil. Pour over noodles and toss to coat evenly. Set aside. In a large wok or sauté pan, heat 1 tablespoon of oil over high heat; add chicken and marinade juices, stir-fry until 90% done (about 5 minutes). Remove chicken from wok into a clean bowl and set aside. Add remaining tablespoon of oil to wok; add asparagus, sprinkle lightly with salt; stir-fry until heated through (about 1 minute). Add chicken and juices back into wok. Continue stir-frying for 2 more minutes, or until chicken is completely cooked. Pour over noodles, toss gently and serve with Sriracha Hot Chili Sauce or Hot Chili Oil on the side.